The holidays are fast approaching! Many people have already started decorating and playing classic holiday songs, but after Thanksgiving tomorrow, it will be the official start of Christmas season. There are many ways to get into the Christmas spirit here on the Central Coast – from celebrations to events to markets. While many events will be going on all December, here are some ways that will help kick off the holidays and get you excited for this amazing season! These also might be some great alternatives to the madness that is Black Friday shopping (for more ideas on this, check out our tips to opt out of Black Friday). If you’ve ever wanted to travel abroad and spend time in a classic German Christmas market, drinking spiced wine and listening to carolers… now’s your chance to do it here on the Central Coast! A staple of the Cambria community for 5 years, the Cambria Christmas Market offers tempting local food and drink, along with traditional brats, baked goods, and Glühwein (traditional German spiced wine). Stay warm and cozy at the market while walking around beautiful displays featuring over one million light! It opens on November 25 (the Friday immediately after Thanksgiving) and will stay open until December 23rd. There are several Christmas parades coming up that promise a festive, fun, and family-friendly time. Visit downtown Arroyo Grande on November 27th for a Christmas concert and parade, beginning at 5 pm. The parade will march through historic, quaint downtown Arroyo Grande before coming to an end at Harvest Church, where there will be the lighting of the Village Christmas Tree and a live nativity scene. This is a great, more low-key option for families. 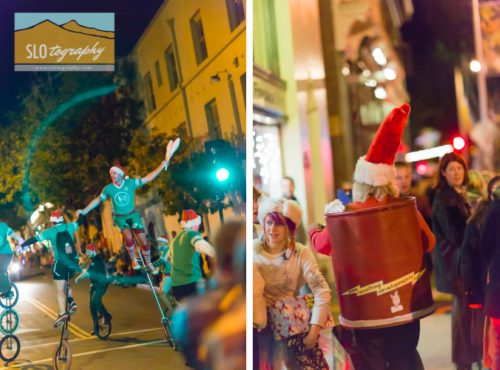 If you’re looking to attend a larger event, the biggest parade is the Downtown San Luis Obispo holiday parade on December 2nd. With thousands of spectators and featuring all types of floats, vehicles, marching bands, dancers, and more, it’s sure to be an exciting time to bring in the holiday spirit. Finally, for maritime lovers, come to the Embarcadero in Morro Bay for the Lighted Boat Parade – a procession of meticulously decorated Christmas skiffs, yachts, fishing boats, cutters, sailboats, and kayaks. On December 10, come around 4:30 for live music and more preceding the parade. This unique Central Coast parade is not one to miss! One of the most obvious ways to indicate that Christmastime is actually here are lighting ceremonies! People gather together for the first lighting of a giant Christmas tree and celebrate the official start of the season as a community. 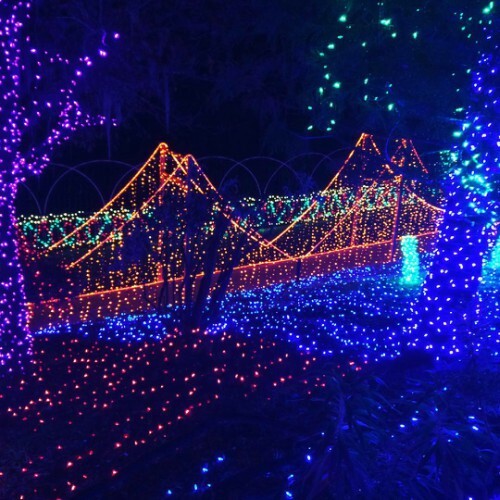 On the Central Coast, we have a couple options for fun lighting ceremonies. On December 2nd in Pismo Beach, visit the Pier from 5:30 to 8:30 for a free, family-fun event. Even though it doesn’t snow here at the beach, the Tree Lighting Ceremony will include fresh snow! Additionally, kids will love the bounce houses, crafts, music, and cookie decorating. The actual lighting ceremony takes place at 6:00 pm. Another popular lighting ceremony will be in Paso Robles on Friday, November 27th – the lighting of the downtown trees will take place at 5:30 pm. It will officially bring holiday decor to downtown Paso Robles. This much-loved Paso Robles tradition will find Mrs. Clause and other costumed characters in the downtown City Park, excited to ring in the holiday season. Escape from cold weather and enjoy Christmas by the beach this holiday season. With no shortage of fun, festive activities, the Central Coast is a great place to ring in the holidays and celebrate the spirit of Christmas – from Avila Beach to Paso Robles. Find out more about our hotel offerings here! Pismo vs. Avila: Where Should You Stay?